The funeral began with Buddhist bathing rituals at a temple in Bangkok, Thailand, and will be followed by recitation ceremonies over seven days. 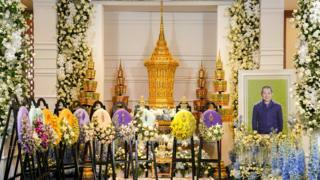 Leicester City players are due to fly out to Thailand for the funeral later after their game against Cardiff. Srivaddhanaprabha Vichai died with two members of his staff, the pilot and a passenger when the helicopter crashed. It came down moments after taking off from the King Power Stadium on 27 October. Jonathan Head, the BBC's South East Asia correspondent, is at the temple and said the ceremony was being held behind closed doors. He said elements of status at the funeral were very important. Thailand's Deputy Prime Minister Prawit Wongsuwan, the manager of Thailand's women's football team, and the president of the Football Association of Thailand are among the guests at the funeral. Leicester City are playing Cardiff this afternoon - their first match since the crash. All this weekend's Premier League games will be preceded by a minute's silence and players will wear black armbands. When Leicester fans arrived at the King Power Stadium before making the journey to the game in Wales, they were given free breakfast by the club.